Sciatica refers to pain that begins in the hip and buttocks and continues all the way down the leg. True sciatica is a condition that occurs when a herniated lumbar disc compresses one of the contributing roots of the sciatic nerve. This condition is often accompanied by low back pain, which can be more or less severe than the leg pain. The term “sciatica” indicates that the sciatic nerve, which travels from the lower back through the buttocks and into the leg, is thought to be the cause of the pain in this condition. Sciatica is less common than other causes and conditions that produce back pain. For instance, sporting activities, recreational activities, and heavy labor can cause back and leg pain, which is commonly misdiagnosed as sciatica. The challenge for a physician is to distinguish between radicular pain, which is caused by an inflamed nerve root, and referred pain, which is a result of a musculoskeletal sprain or strain. The most common symptom of true sciatica is posterior thigh, lower leg or foot pain that can be much worse than the accompanying lower back pain. Usually a patient will experience moderate to severe pain, which begins in the buttocks and runs down through the leg or foot. It is important to know that true sciatica will produce pain that radiates beyond the knee. Often a patient will have a previous history of lower back pain beginning a few days or weeks before the leg pain occurs, then the leg pain becomes worse than the back pain, and in some cases the back pain will completely disappear. However, in the case of longstanding history of sciatica, the pain may gradually become localized to the buttocks and back of the leg. In this situation, the patient may have a vague aching pain that does not reach all the way to the lower leg or foot, though it may have done so earlier in the course of the disease. Often there is not a specific traumatic event or motion associated with the onset of sciatica. Standing, sitting, heavy lifting, sneezing, or having a bowel movement may aggravate the pain. Lying down is usually the most comfortable position. Occasionally paresthesias, weakness and diminished bowel or bladder function will accompany sciatica, but these are rare symptoms. A thorough history and physical examination is an important part of the diagnosis of sciatica. Nerve root tension tests can be used to confirm the presence of sciatica by attempting to reproduce the discomfort with certain motions and body positions. 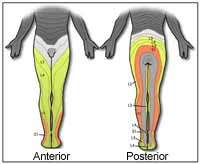 These tests are performed by a doctor and involve moving the legs in certain ways that slightly stretch the sciatic nerve. If the patient experiences pain during these tests, an irritated sciatic nerve is likely to be a source of the pain. Your doctor will be able to discuss with you what your diagnosis means in terms of treatment options. Non-surgical therapies such as medication, rest or physical therapy are typically recommended first. However, if these therapies fail to provide lasting relief over the reasonable length of time, or if there is evidence that nerve root compression is causing nerve damage, your doctor may recommend spine surgery. The goal of surgery is alleviate your symptoms and prevent further damage by removing the source of pressure on the spinal nerve roots. Spinal surgeons perform a variety of procedures to achieve spinal decompression. When determining the optimal surgical procedure, a surgeon will consider patient pathology (the structural and functional changes that led to the patient’s neurological dysfunction), the level or levels of the spine affected, the patient’s medical history and his or her surgical experience and training. Today, spinal decompression also can be performed using a minimally invasive technique that allows your spine surgeon to dilate the muscles surrounding your spine rather than stripping the muscles away from the spine.